In small microwavable bawl, microwave milk chocolate chips, 2 tablespoons of the milk and 2 tablespoons of the butter uncovered on High 50 to 60 seconds, stirring until smooth. Cool to room temperature, about 20 minutes. In another small microwavable bawl, microwave dark chocolate chips, remaining 2 tablespoons milk and 2 tablespoons butter uncovered on High 30 to 40 seconds, stirring until smooth. Cool to room temperature, about 10 minutes. Meanwhile, in chilled medium bowl, beat whipping cream with electric mixer on high speed until stiff peaks form. Reserve 1/2 cup whipped cream for garnish. Fold 1 cup of the remaining whipped cream into the dark chocolate mixture. Fold remaining 1 cup whipped cream into the milk chocolate mixture. 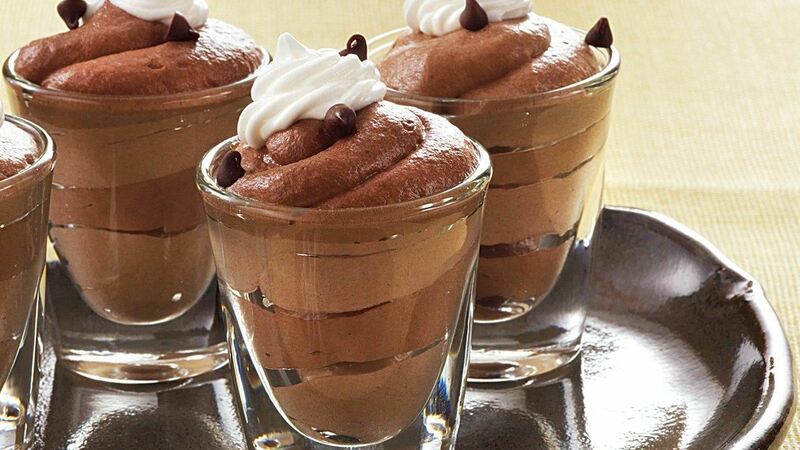 Divide and layer chocolate mousses evenly among 12 shot glasses. Top each with reserved whipped cream. Refrigerate at least 1 hour. Sprinkle with chocolate chips.